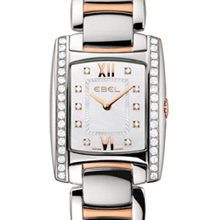 Ebel is world-renowned for its iconic two-tone models, and the Brasilia steel and gold watches with their streamlined rectangular case and H-shaped bracelets have confirmed this distinctive flair. Now, speaking straight from the heart and to the heart with its vibrant shade, the splendor of red gold lights up the latest Brasilia Mini collection. 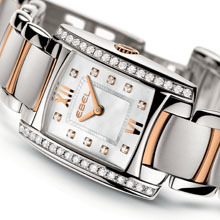 Making a glowing appearance on the bracelet in the form of intermediate central links and on the iridescent mother-of-pearl dial through the logo, hands, 6 and 12 o’clock Roman numerals and even surrounding the diamond hour-markers, red gold accents lend an incandescent touch of warmth that expresses a uniquely refined perception of true luxury.